Low-entry bike with extra load capacity. E-bikes represent a completely new dimension in mobility. Older and less athletic people in particular will find unimagined possibilities of locomotion and movement. For large and heavy people, the maximum permissible total weight of many e-bikes is not sufficient. Our Kreidler Vitality Eco Plus has a particularly stable aluminium frame with low entry, which allows a maximum permissible weight of up to 170 kg. And the best part is: The increased carrying capacity of the matte black city e-bike by no means comes at the expense of design, comfort and handling! The Bosch Performance mid-mounted motor offers plenty of power and dynamics. A Suntour suspension fork ensures comfortable damping of the e-bike and consistently high riding comfort. 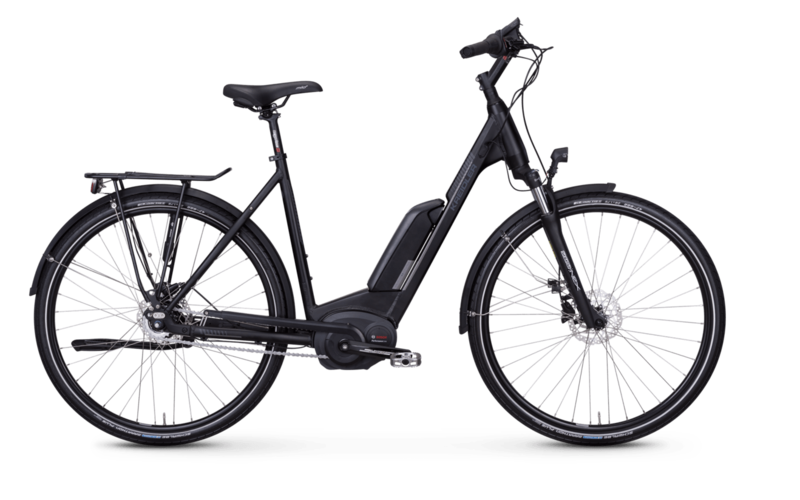 This e-bike also features powerful Shimano hydraulic disc brakes. The all-around high quality equipped e-bike rides on Schwalbe Marathon Plus tyres - a top level tyre.